Paani is central to the North Shore beaches. End your day enjoying ocean & golf views from your lanai. Anini Beach has the longest reef in Hawaii. You can walk there from Pa`ani down a pretty jungle trail or it`s about a 15 minute drive. Pa`ani has a very complete kitchen with almost anything you could want to have a gourmet dinner. The living room has travertine floors & great views toward the golf course & ocean. On Fridays, see the cruise ship go by in the afternoon from the front lanai & living room. Every day you can enjoy the many walking paths in Princeville. Hanalei Bay with its 2 mile beach and small town full of restaurants is under a 10 minute drive. Pa`ani has a king size bed in the 2nd floor master bedroom & with it`s own lanai, two sinks, large tub and separate shower. The second bedroom on the main floor has a queen and small lanai. The loft has a full size bed and is open to the windows above the living room. You can hang loose at Kahili Bay & the Kilauea River mouth about 10 minutes away. Every day you can enjoy the many walking paths in Princeville, beautiful views abound. This is an end unit so neighbors only on one side. No one above or below you. Three walls for windows and breezes. This is a great place to enjoy a dinner of fresh island fish & produce from our local farmers markets and fish markets. A view of the course just before you head down the trail to Anini about a 10 minute walk. There is a huge old banyan tree between Pa`ani and the golf course. It is frequently an avian hub of activity. The master bath has a walk in shower as well as two separate sink areas and a large tub not shown. There are 20 or so very different beaches within 30 minutes of Pa`ani. This secret spot is less than 20 minutes away. My favorite East side attraction is the long beach bike path which is about 30 minutes away. Of course, if you`re in no mood to explore you can always take a dip in Puamana`s pool or just enjoy the sunsets. 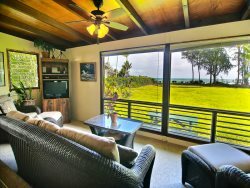 Pa‘ani is an ocean view Makai Golf Course vacation condo in Princeville. Located on the golf course with views of the #3 putting green and #4 tee box, this ocean-view condo rental offers great views of the golf course & Pacific & easy access to the many local beaches. It is also close to a small quiet community swimming pool to take a dip in and cool off after a hard day on the course or the beach. This vacation rental is in a great location to enjoy all that Kauai’s North Shore and Princeville have to offer. Take a short trail down to 'Anini Beach. Hop in the car and be out on the main road within minutes where over 20 beautiful beaches are within 25 minutes. Hanalei Bay, Hanalei Beach, Hanalei River and the tiny Hanalei town of restaurants, boutiques and water sports is about 7 minutes away. Princeville's many long walking paths with gorgeous mountain views are waiting for you as well. This is a 2 story corner-unit ocean-view condo with windows on three walls to let in light and the ocean breezes. Pa'ani has a very open feel and a very well equipped kitchen for making gourmet meals from the fresh island produce and fish from our farmer's markets and fish markets. You'll enjoy the gas grill on the deck while watching sunset skies. P‘ani is the Hawaiian word for play sport or a game, so appropriate for this ocean view condo in Princeville. Whether you are a golfer or not, you will love the openness that being on the golf course provides. In your backyard there is a gorgeous old Hawaiian Banyan tree between your condo and the golf fairway. Enjoy the play of light on its roots and branches while at the dining table or out on the deck. This 2 bedroom, 2 bath condo with loft can sleep up to 6. The price is based on 4 people, additional people beyond 4 are $15 each per night. All bed linens, bath towels, coolers, beach towels and beach chairs for the beach are provided. Wireless internet too. The master bedroom has a king size bed, TV and ample closet space. There is a small lanai off the bedroom that faces East for trade wind ventilation. You can see a slice of the ocean over the trees. You can also see the trail to the Puamana community swimming pool. A key to the pool will be found inside Pa'ani. There is a relaxing jetted tub in the master bath. His and her sinks give lots of room for you both. A tile stall shower rounds out the bathroom. The downstairs bedroom has a queen size bed, its own lanai, and a very nice bathroom with two sinks. For this reason, Pa'ani is a great home for two couples to share. There is a TV in this bedroom as well so it would be great for the kids. The loft with its full size futon is another sleeping option. It is off the master bedroom. Venture down the forested trail to 'Anini Beach, with fantastic water for snorkeling and swimming. A leisurely stroll will take about 10 minutes to the beach, and 20 minutes back. Be extra careful when the trail is wet because it does get slippery. At the top of the trail you will enjoy views of the golf course with 'Anini Reef to your left and to your right, you will see Namolokama & Hihimanu Mountains of the Hanalei range. You park at the end of the third Puamana parking lot, with a numbered stall very close to the unit. A second car would park in the guest parking area. This third lot is located just prior to the entrance into the Westin Resort. The Westin has a very nice restaurant and spa a super short walk from Pa'ani. Restaurants, Shopping, Hiking, Golf, Tennis, Surfing, Boating, Kayaking, Biking, Walking trails, Zip lining, Horseback riding & Botanical gardens.